Stuff Points: Earn 120 points when you buy this stuff. This commercial size container is filled with a naturally powerful cleaner, and when buying in bulk, it offers the most liquid for your money. It's perfect for larger companies, or professionals that use it on a regular basis, but with a 25 year shelf life, it can be purchased by anyone in order to save money and have plenty of this valuable cleaning solution on hand. Use it full strength for tough jobs, or use as little as a single teaspoon in a quart of water when cleaning easy stuff like windows and stainless steel. It's strong enough to lift stubborn stains out of carpeting, and dissolve oils stains on concrete, but it's also completely safe for use around children and pets thanks to the gentle ingredients. Easily add to steam cleaners and pressure washers in place of the ineffective options that leave surfaces less than clean, and sticky with residue, or dilute as directed to create effective cleaning sprays that only cost pennies. You can mop floors, degrease cabinets, remove stains from upholstery, clean clothing, shampoo rugs, remove hard water stains and so much more. With hundreds of viable jobs, and outstanding results with almost every application, this safe cleaner makes a great addition to existing stuff, and it allows you to replace many other options with a single green cleanser that actually works. Effective. Almost unbelievable in it's ability, this stuff easily cleans messes that other products can't handle, even with harsh chemicals and other dangerous stuff. Safe. No phosphates, no harsh chemicals, zero abrasives, not a drop of ammonia, and it's totally biodegradable. Safe for use around food, humans and animals, this cleaner is safe and effective, so it can be used almost anywhere. Eco-Friendly. Although it's powerful, it's also biodegradable and non-toxic. Never worry about it going down the drain, or touching your skin because every ingredient is completely safe for you and your environment. Concentrated. Stronger than the competition, but totally gentle, and safe for use on almost any material. Some jobs only require a single teaspoon, and others may require a few tablespoons, but only very tough messes will require use at full strength. Versatile. Literally hundreds of possible jobs, this is truly an all purpose cleaner. Get it for the one job you know it works for, but try on many others to discover just how versatile it is. Fast. No scrubbing for hours, or repeat applications. Get professional quality results in less time, and with less effort. Not only does it work quickly, it does most of the work for you. Just apply and let sit when necessary, and it will break down stains and other grime for easy removal. Simple. With the addition of a removable spout with on/off valve, and a built in handle, the cleaner is easy to dispense, store, and transport. Add to that the fact that you never have to question effectiveness, or wonder if it will work on a certain job, and you have one simple and effective cleaning solution. What To Use It On. There are more than one hundred stains and messes that can be cleaned with this powerful, pink natural cleaner. The list below will give you an idea of what it can handle, but for a more comprehensive look at the full range of p[possibilities, check out the cleaning guide here: < a href="quicknbrite_cleaning.htm"> Cleaning with Quick N Brite. Clothing - Use directly on clothes to spot clean and remove stains, use to improve performance of traditional detergents, or use as a detergent replacement. Vehicles - Dilute with water and add to your windshield washer reservoir, or use in place of other soaps to wash the exterior. Also great inside for upholstery and other surfaces. Carpeting - Spray on to remove spots and spills, or add to a steam cleaner to do full rooms. You can use less, and get better results when compared to traditional options, and there will be no stick y residue. Hard Flooring - Add to water to mop tile, linoleum or hardwood. It easily lifts dirt and grime without leaving behind a film or causing any harm to surfaces. Pets - Eliminate stinky odors as you remove staining, and quickly rejuvenate carpets, rugs, furniture and other areas where accidents happen. Can also be used to remove skunk spray, or give a normal bath. Brick and Stone - Effectively clean natural stone and bricks with little effort. Even works on stubborn stuff like soot and creosote. Remove soot build up from brick or stone. Windows and Mirrors. - Make a light solution using one or two teaspoon,s and use it to make glass shine. Easily remove dirt without leaving behind streaks. It will even work on similar surfaces like stainless steel and other metals. Bathroom - Eliminate hard water and soap scum in your tub or shower, or clean any other surface with speed and effectiveness. Kitchen - Clean greasy cabinets, remove stubborn build up in your oven, or make your sink shine. Almost any surface or mess can be cleaned with ease. Don't need quite this much? We have several other sizes available, so if you would prefer a smaller container, take a look at the single gallon jug, 64 ounce jug, or 32 ounce jug. Uses Upholstery, fabric, tubs, tile, carpet, laundry, cars, stovetops, countertops and more. Integrated Spout Yes - Attach or remove. Complete with on/off valve. A high powered cleaner that's safe for use on almost any surface. This commercial size container allows you to save money when purchasing a large amount, and with hundreds of applications, it will cut costs and reduce harsh chemicals without compromising cleanliness. Order Yours Today! This is /he best cleaner yet if you think you're tub tiles sink cabinets are clean try this product you can wash your hands with it is very mile work horse. Will be back. Glad I got five gallon worth it. 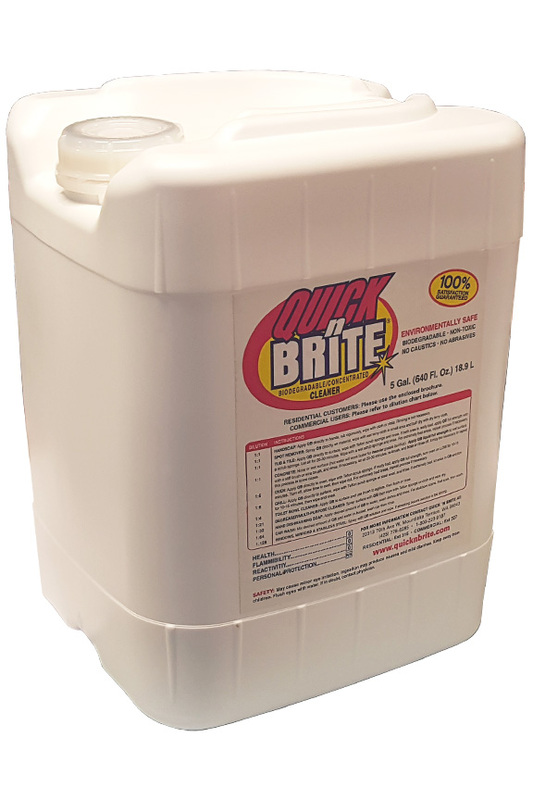 Quick 'n Brite - A safe and effective cleaner for all over your home.